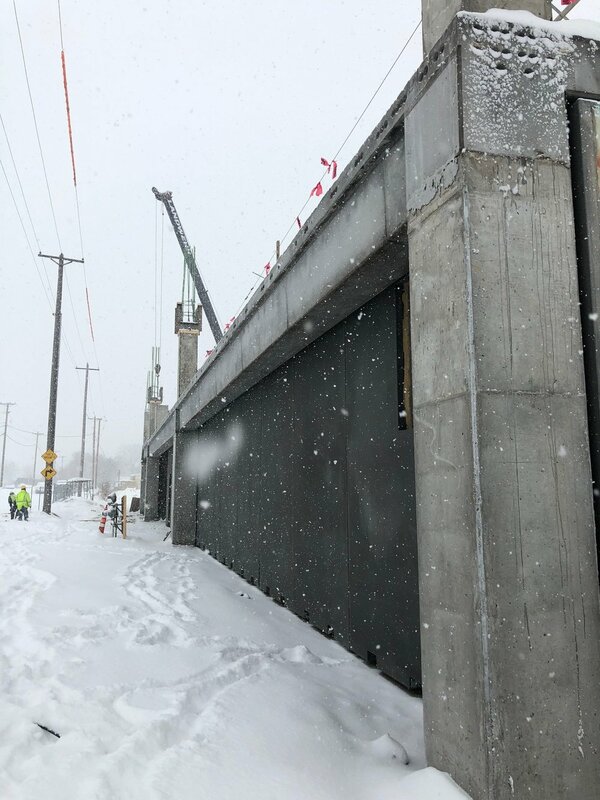 In spite of the recent “spring” weather, the precast panels are starting to be installed at the City of Minneapolis ESS&MF project. The parking ramp structure is shaping up now that the weather has turned and our project is starting to look more like a building. The sun streams across the new HCM workstations, on this, the second day of spring. HCM is excited to share our latest update to Fire station #13. HCM has expanded our work station area by removing the wall between our conference room and the rest of the office. We now have four additional workstations and a whole lot of sun, an all around win. Following the completion of the Anderson Pasture Warehouse Expansion, Anderson Windows in Garland Texas primes for the addition of a Compounder in their production space. Interior work includes a new lab space, additional equipment and expanded storage. Exterior work will include the addition of three vinyl silos housing raw material to be used in the new compounder for Fibrex Material Production. A&P and Wells were busy setting the last of the precast concrete “tuck-under” panels on the ESS&MF project site yesterday. The acid etched, charcoal gray panels look great and it is fun to see the first walls starting to enclose space on this project. Most of the form work and shoring are in place for the third level parking deck as well. Lindsay and Natalia make quick work of the parking lot. Unfortunately, the snow was too fluffy for an HCM Snowman— there’s always the next storm! 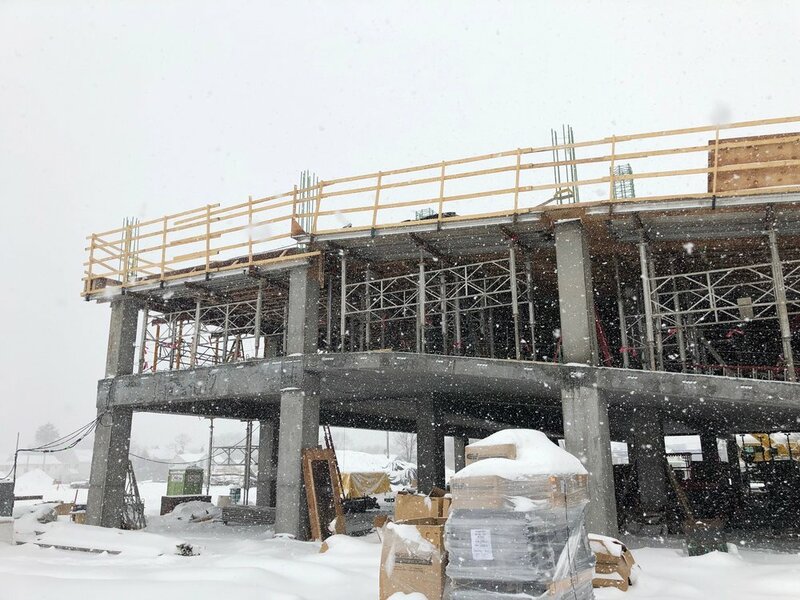 The ESSF team braved 4 degree temperatures and a -7 windchill last week to make their first concrete pour for the Minneapolis East Side Storage & Maintenance Facility parking garage. In December, the HCM team participated in some friendly office competition— bringing in comfort food favorites straight from the crockpot. The Crockpot Cookoff crown went to Nick Lager with his apple crumble dessert while runner up dishes included authentic homemade pierogi and mega mac & cheese. The big CNC Machine move into Brooklyn Park! The HCM team is excited to share our work for the new Protolabs Brooklyn Park building. Check out Protolabs’ timelapse of the space and ultimate move of 295 CNC machines! Cedarholm Community Building has been awarded the 2018 MN Recreation and Parks Association Award for building design! Led by architect Dan Lawrence of HCM, the project was completed in the summer of 2018 and was constructed by Jorgenson Construction. The project will be featured in the fall issue of the Minnesota Recreation & Park Association’s MINNESOTA magazine. Congrats to all that touched the project inside and outside of HCM! Summer has been a busy season for all, with no exception for the team here at HCM. 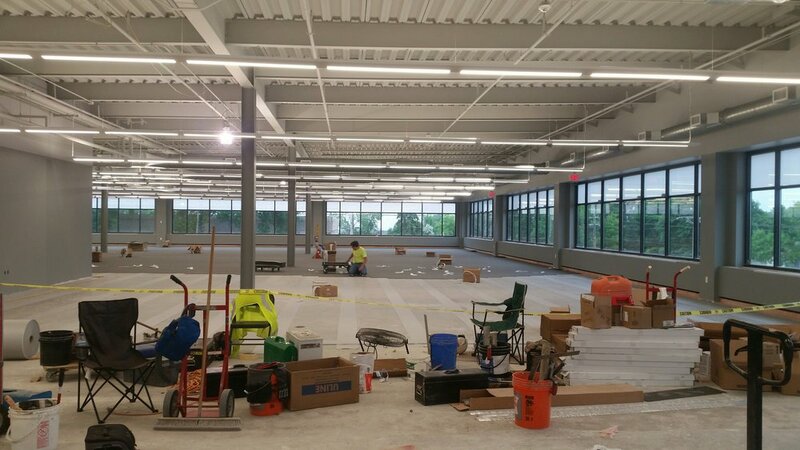 Amidst shared brat & brisket lunches and sunny boat cruises, HCM has been diligently working on the design of expanded warehouse production space at Andersen Corp. Headquarters in Bayport, MN. This expansion adds extrusion capabilities for Andersen’s proprietary Fibrex® material, which will help support the sales growth of their quickly expanding 100 Series window products. Construction took off on the Andersen Pasture Warehouse Building in May and is set to be completed by ­­the end of the year. The 60,000 SF expansion is estimated to create approximately 40 more jobs for the corporation to support their rapidly growing production needs. Design of the expansion integrates the existing building with new construction through a continuation of the gable roof structure to the North and an expansion of a high ceiling storage space to the South. Construction on both ends consists of a precast shell, designed to color match the existing CMU of the original building. A unique portion within the scope of this project addresses environmental sustainability of the site, through the construction of a large infiltration basin to the west of the building designed by Barr Engineering (construction progress shots below). Stay tuned for more updates as construction approaches completion! The walls are up at Wakefield Park’s Community Building and the city of Maplewood looks forward to the completion of the project later this year. Versicon (the contractor) has the walls framed up and is working towards a full enclosure. You can regularly see Kimley Horn on site as they continue to manage the project’s various site improvements and as the new structure takes shape. 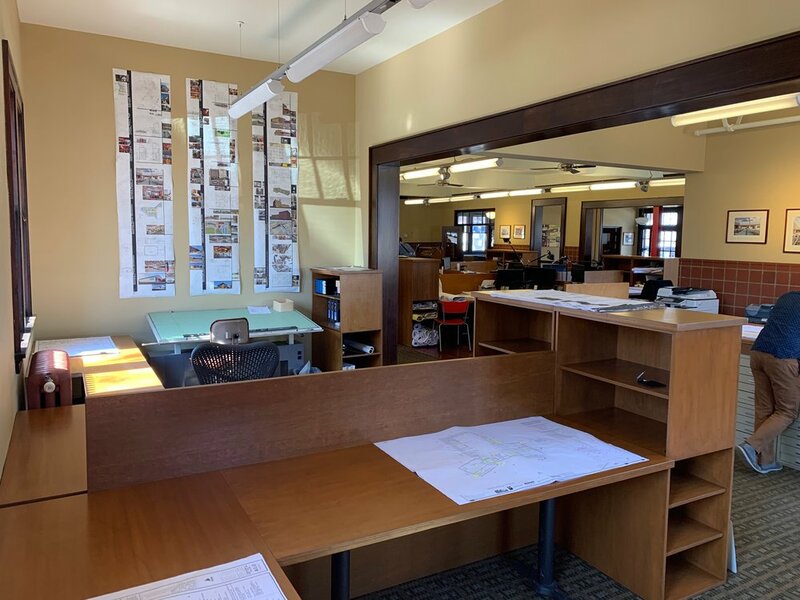 Here at HCM we are grateful for such a strong team, from the various city employees involved to the contractor and subcontractors, who are turning out a fantastic project for the citizens of Maplewood. We will continue to get drone footage as the project continues to progress. Check back to see the rest of the project over the next couple months. HCM would like to welcome new employee Jeff Swiontkowski to the team! Jeff brings a journalistic approach to research, design and the architectural profession. As a newly licensed architect, he specializes in programming and schematic design and has a particular eye for crafting project narratives and expressing these throughout the built environment. After completing his Journalism BA at the University of Minnesota in 2010, he began studying architecture, completing a Bachelors of Design and Architecture in 2013 and earning his Masters of Architecture from the University of Kansas in 2016. Since then, he has worked on a wide variety of projects in both the public and private sector. In his down time you can find him cycling, woodworking or at the nearest ice arena. The City of Woodbury Public Works and Parks Maintenance Renovation & Expansion project was approved last month by the City Council to proceed into the construction phase starting this summer. This project touches on three types of construction in one: renovation, expansion and new construction! HCM celebrated the 6 years of committed hard work and dedication by beloved co-worker Bri Hodges with a farewell lunch at Sea Salt Eatery. Bri has joined her husband in a new business venture. We thank Bri for her enthusiasm, tenacity, and contributions to numerous projects over the years. Best wishes, Bri! In the final month of construction, Banner Engineering is receiving paint on the walls, stair glass guardrails are being installed and millwork, ceilings, and lighting are being situated throughout. Furniture will be installed mid July and owner move-in is slated for the beginning of August. As many of you know, HCM recently celebrated 20 years of business! We at the office wanted to share an article written about HCM Architects in the 90s. When this was written, we were located in the North Loop of Minneapolis (before it was the North Loop that it is today!). The cover of the magazine is a little dated, but check out the photo of the partners below! Cedarholm Community Building and Clubhouse in Roseville, MN is nearing construction completion. The 5,000 square foot building features a 100-person capacity Community Room with adjoining exterior patio space overlooking the great views of the golf course. Check it out as part of the City's annual Rosefest this summer!